Matt Feeney and Larry Winthrop have been making music together in Arizona for 35 years, first as members of a folk trio (with Ellen Hawley McWhirter) called “Turning The Tide”. Following Ellen’s move from Arizona, Matt and Larry formed “feeney/winthrop” in the early 1990’s. A primary focus of the group since its formation has been benefit concerts supporting organizations that assist Phoenix’s homeless population. Since 2008, feeney/winthrop has performed an annual concert supporting St. Joseph The Worker Job Service, an organization devoted to finding full-time employment for the homeless. Through 2018, these concerts have raised more than $400,000. Larry’s wife, Pat, joined the group in the late 1990’s. 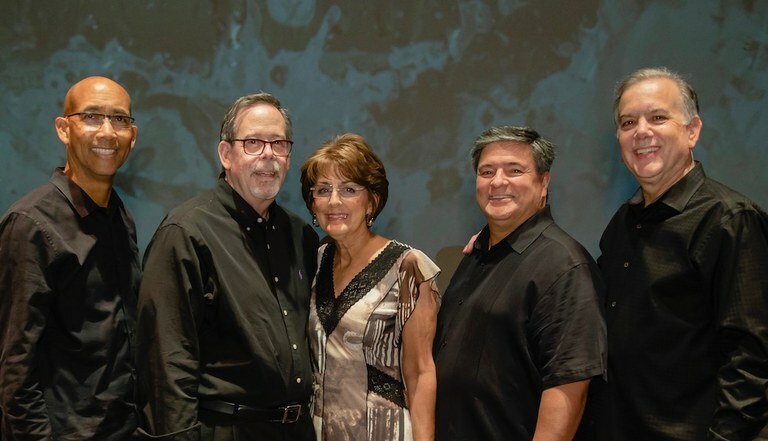 Gerry Garcia, who played bass in a band with Matt at the University of Notre Dame in the late 1970’s, travels across the country every year to participate in the annual concert. Matt’s sister, Kathleen, was a valued member of the group for several years, contributing her rich vocals and warm stage presence to the group. Kathleen has now moved on to perform with her church. Matt’s brother, Mike, served as the group’s recording engineer for many years until his death in 2008. In 2012, long-time friend and jazz pianist Luke Holton joined the group, playing keyboards and producing feeney/winthrop CDs at Snoring Dog Recording Studio. To date, feeney/winthrop has recorded several CDs. The group’s five most recent CD’s (“Give Yourself to Love” (2011), “Simple Gifts – A Seasonal Offering” (2012), “Something Old, Something New” (2016), “Fellow Passengers” (2017), and “Love Will Win the Day” (2018)) and the singles, “The Fields of Bethlehem” (2011) and “Snow Day” (2015), are available through Amazon.com and iTunes. You can purchase their music here and view videos from previous performances here. To keep up with feeney/winthrop news and upcoming performances join our mailing list here!